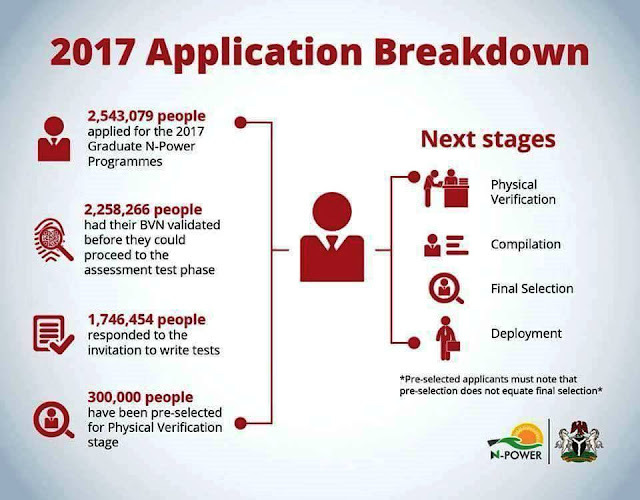 NPower Physical Verification 2017, After Pre-Selection What next? Home / earning / help / Tech / Trainings / NPower Physical Verification 2017, After Pre-Selection What next? Congratulations! 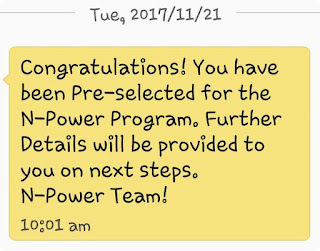 If you have been pre-selected for the NPower Program 2017 Second Batch, it means you are qualify for the NPower Physical Verification on the date that has been announced. 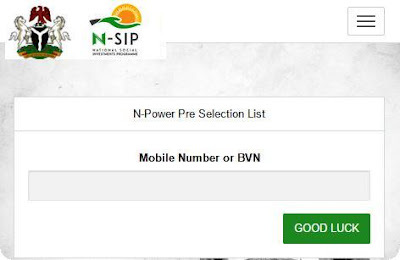 If you have not yet checked, visit N-Power Pre-Selection Checking Portal , in the search box, type in your BVN (preferred) or the Phone number you used for registration. Your status will appear after a while indicating success or otherwise. 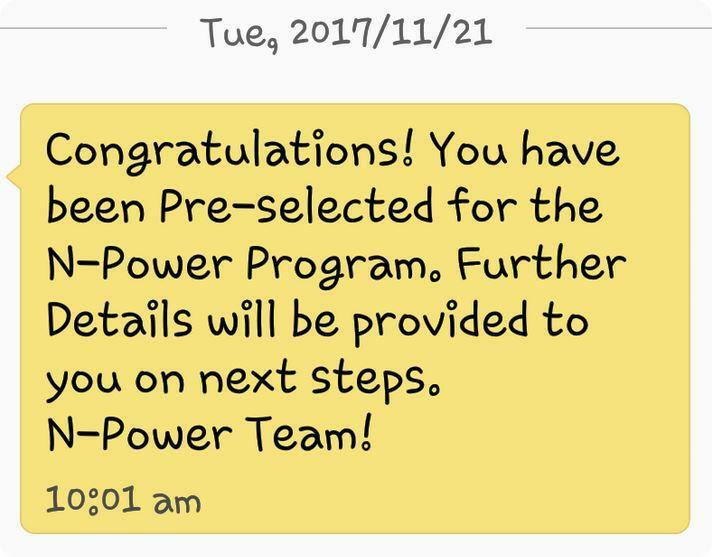 If you have been pre-selected, you will see the message below and furthermore, you will also receive a SMS and email congratulating you on your success. Next step is the Physical Verification; this is where the actual confirmation of all the information you submitted online will be verified. If the information and qualifications are correct, you will be confirmed as a N-Power beneficiary if not, you will be screened out. 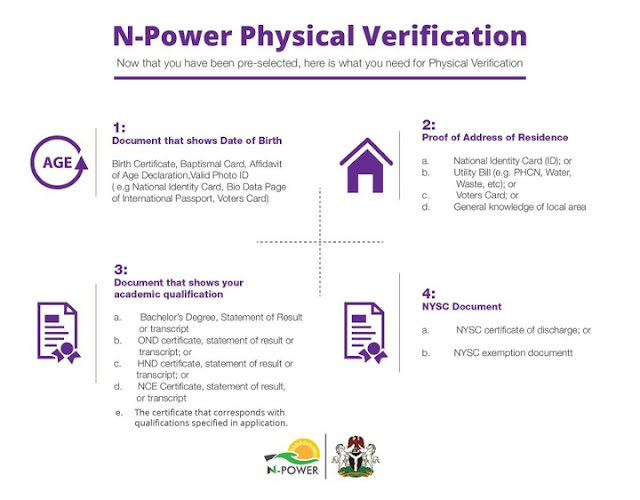 The Physical Verification stage is the process of physically verifying the Age, Gender, Residential Address and LGA, Academic Qualification, and NYSC completion of applicants. 1. Your Physical Verification Center is your Residential Local Government Area Secretariat. 2. You are NOT required to go along with your BVN slip for physical verification. 3. Follow instructions at the center. Be orderly. Be courteous. 4. Everything stated here and in the image below apply to 2016 applicants who are on the waiting list. These applicants have already received an SMS that they are on the list. 5. Do NOT use information from blogs or unofficial N-Power Channels. Use information shared on our official N-Power pages. Any acceptable National Identification card that clearly shows your name. Physical Verification will commence on Monday, December 4th and end Friday, December 15th, 2017 across Nigeria. In the week of the 4th, States will have different start dates. For example, State A may start on Monday and State B will start on Wednesday. The venue will be at the respective Local Government Secretariat of Residence or any other venue that will be officially communicated to you via SMS. After Successful NPower Physical Verification? NPower will conduct an in-house compilation before the final selection, thereafter, you will be assigned to schools and other organisations interested in your skills depending on the category you applied for. Upon reporting at your Place of Assignment, you will fill forms given to you by NPower and have it endorsed by the Head of the Organisation you are to work under and return same to the NPower Office. After then, you will process your payment details and prepare for your device collection. If you have any issues regarding difficulties in accessing the NPower portal or any other issues, you can reach NPower on their Social Media handle on Facebook www.facebook.com/npowerng.